Picking the right snowboarding jacket is really important, not only because you are choosing the only outfit for your snowboarding holiday, it also protects you from all weather conditions… from lovely sunny day to whiteout conditions. It’s actually the cornerstone for protection against unwanted factors causing by different weather conditions so you can focus on riding only. In this article, I’m going to show you how to choose the best snowboard jacket that fits, in total there are three important factors that are worth considering. In the meantime, I’ll also recommend some of the best jackets available in the market. See more below. Roxy Womens Wilder 2L Gore-Tex Jacket: Great functions, double layered Gore-tex, super warm, lightweight and slim cut, great for all conditions, super nice for advanced to expert snowboarders. Burton Women’s AK 2L Embark Jacket: Great functions, double layered Gore-tex, super warm, lightweight, AK fit offers more room for movement, extra protection for deep powder, more expensive, great for advanced to expert snowboarders. DC Women’s Cruiser Tailored Fit Snow Jacket: Price point jackets with good-looking, loads of color and pattern choice, well-balanced functions and lots of pockets too, may need to wear a down middle layer in colder days. Volcom Womens Bolt Ins Jacket: Another stylish price point jackets with loads of color choice and slim cut, well-balanced function jacket with most basic features like the powder skirt, hood. Jacket-to-pant interface provides extra warmth and protection against snow. The downside is there are just 2 pockets and I would consider it as a shell jacket instead of “Insulated”. A down middle layer is needed. Snowboarding Jacket for Women: What to Consider? Yup! Let’s face it ladies, over 95% of us consider this as the most important factor, or at least, I do! We all want to look good on the mountain!? When I first enter a shop I always look at those jackets with the color I like first, not their functions and compatibility. For beginners: Looking good makes you happier while you are still working so hard in learning snowboarding… Wearing something you like is one of those not many factors you can control while you are still not very good at controlling your board. For intermediates: So now you are a better rider and capable to go to a more different part of the mountain! Which also means you are going to take more and more photos now!! More photos = more intention to wear something you like. For advanced riders to expert: You are the stars in the resorts, loads of people are looking at you, discussing your skills and riding form. Image Dear! Image!!! Alright, so now we all agree that the fashion component is important, let’s move on to the even more important part: functions. The look takes care of your mental happiness while functions are physically saving your life on the mountain, keeping you warm and dry under all weather conditions. So yes, please pick a jacket you like and with great functions! Insulation simply means how warm your jacket is, normally it is divided into 2 categories: Insulated and Shell. Insulated jackets containing an insulation layer under the outer waterproof layer. They are super warm, and mostly, more expensive than a shell outerwear. A outerwear with down insulation is usually warmer than one with synthetic insulation. Shell outerwear offers easier movement and less warm and less weight than an insulated jacket since there is no built-in insulation. Normally it’s cheaper than an insulated outerwear comparing to the same brand or similar tech products. Noted that it’s not always better to pick an insulated outerwear than a shell, its more about you prefer “all-in-one” or flexibility. An insulated jacket may be too warm for a sunny and warm day that you gotta unzip your jackets; while you need to wear different layers for a shell jacket under cold winter. It’s more about when and where you are going for your snowboarding holiday. It’s quite often for me to spend my whole winter in the mountains (i.e. from November to April), I always pick a shell plus a down middle layer when I am only allowed to bring one outerwear with me because of luggage limitation. However, if you are planning your trip during mid-January, it may be a better idea to pick an insulated outerwear. Pick a jacket that is both waterproof and breathable! Waterproof ability concerning about your jacket’s ability to keep out the water while breathability is about the degree of moisture i.e. sweat! that can pass from inside the jacket to the outside. Both components are tended to keep your body dry, just one is dealing with the water from outside the jacket while the other is handling the water from inside. Normally a jacket with 10000 mm or above 10,000 mm water resistance and breathability can offer you pretty fine performance. For sure, the higher the number, the better the performance, well… very likely the more expensive too! Tips: Get a bottle of waterproof spray and apply an additional waterproof layer onto your jackets on a rainy day is a good and cheap idea to keep yourself dry. If you are someone with the budget and is looking for an ultimate waterproof and breathable jacket, go for a “Gore-Tex” Jacket! “GUARANTEED TO KEEP YOU DRY!! !” How impressive!? Powder skirts are the elasticated bands that seal the gaps between your jacket and pants so to keep the snow and cold air out. Pit vents usually can be found under the arm/ by the side of your body or chest. Opening the vents can cool you off by releasing the heat and moisture when you are feeling too hot, for example, when you are riding on a warm sunny day or going for sightseeing on you break day. I would say a hood is another “must have” item in my jacket because I always ride in Hokkaido, Japan, most of the time we are having heavy snowfall throughout the winter. Once I experienced a total of continuous 28 snowing days! The hood really saved most of my days especially by late afternoon, when it’s almost sunset time and the temperature started to drop. Some people would consider a hood is not that important because they are wearing a helmet, I do agree with that, just it’s much warmer when your hood can cover your helmet too. So what I would suggest is – just get one with a hood and make sure it can cover your helmet too. It’s almost like a built-in component among all snowboarding jackets now, just about if it’s fixed or removable. Trust me, it’s not a good idea for beginners to wear a backpack. Once I had a student insisted to bring along his hot tea because he was worried about he would be feeling cold during his first lesson, it ended up was ME carrying his backpack throughout the whole lesson and he didn’t even take a sip of his hot tea coz he was already sweating like hell with all the practices and exercises. Pass pocket, D-rings, Media pockets and Headphone loops are a plus component for your jackets. More entertainment and convenience are always welcomed! Taped seams, waterproof zips, moisture wicking lining, storm flaps are add-ons to increase the water resistance, breathability and windproofing of your outerwear. I would say pick a size bigger than your normal size is a good idea since it left you room for more layers and protection gears while your powder skirt can still keep the snow out. Minus 10 to 20 degrees may not be a good condition to show your beautiful body shape darling. Right, that’s quite a bit I have talked about so let’s move on to what we’ve picked for you. There’s so much you gotta take into account while choosing your snowboarding outfit! To make it easier for you, we have chosen some of the very best snowboarding jackets that will light up your white holiday. This is a piece of beautiful armor that will allow you to rock the mountain even from cold snaps to spring slush. The 2L (Double layers) Gore-Tex and PrimaLoft® Black Eco insulation are gonna provide you with a great balance of warmth, water resistance, breathability, lightweight and low bulk feminine design. Containing a 3 way adjustable and removable hood so you can fit your helmet or beanie in. The zipper was just one way only. Another piece of armor to battle with snow, ice, water, and wind. formed by 2 layers of Gore-Tex, fully Gore-Seam taped fabric, water-resistant zips, micro-adjustable hood, Zipped underarm vents, lightweight and low-profile Primaloft Silver insulation and a removable stretch powder skirt with jacket-to-pant interface. Adding up all these features allow you to do everything you want, from backcountry to freestyle jumps, from tough stormy condition to peaceful sunny day. AK fits allow for more freedom of movement than other jackets. Jacket-to-Pant Integration prevents provide extra protection to keep the snow out from waist-deep powder. It’s usually more expensive than other outerwear, even among Gore-Tex Jackets. A great tailor fit Jacket with stylish look (loads of color available too! ), this is the one I won’t mind to wear all the time, both on the slope or in town. Great cutting offers you room for movement and yet making you look slim though. With a 10K water resistance and 80g of insulation which is kinda normal standard in terms of snowboarding jacket, it’s enough to cope with most snowboarding day but you may want to bring along a middle layer down jacket for tougher conditions. It comes along with powder skirt, vents, and a 3-way adjustable hood. Pockets design is great too. I used to own a DC Jacket and that was one of my favorite outerwear, it’s solid! Great value of money! Great pricing and yet offer great functions! Good looking plus with many pockets to store your items! It would be great to have more pockets and a headphone loop. Another slim fit jacket comes with many color and pattern options and yet with shred-worthy tech. V-science technology provides you with 10k waterproof and 5k breathability on light rain and snow day; features a super suede chin guard and adjustable powder skirt. I would consider this as a shell jacket since 60g insulation may not be enough for colder days. This is a price point jackets! There is no inside pocket. Check if your helmet can fit into the hook of your jacket before purchasing it. Check the stitches of your jackets, it’s always better to have double stitches than single. I used to have one jacket broken within 10 days because of the poor stitching! 2-way zippers are always better than one way. 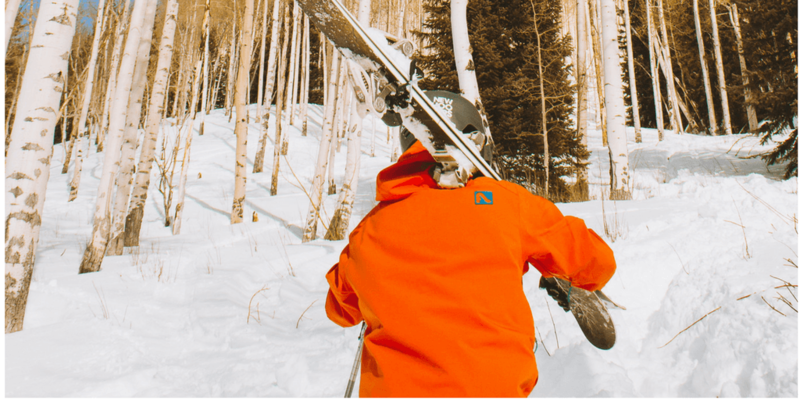 If you love backcountry snowboarding, try to pick a jacket that’s as bright as possible, it’s so much easier for people to spot you! Unless you are planning to buy a new jacket every season, it’s a good idea for you to learn something about how to take care of your jacket. It’s not just about the look and personal hygiene problem, in fact, proper care of your jacket is the key to keep functioning well. Let me try to explain the situation as simple as possible here: our jacket is made up by a fabric containing a waterproof/breathable membrane, and a face fabric coated with a DWR (durable water-repellent treatment). DWR is one of the very important reasons to keep your jacket dry from rain and snow. A simple relation here: water resistance and breathability decrease with DWR wears off. Regular wear, oil, sweat, dirt, etc. are all factors causing negative effects to DWR. So it’s a good idea for us to repair the DWR coating of your jacket when you feel clammy and wet while wearing it. The repair of your outerwear is different depending on different brands’ tech. Here are some general tips you may consider but it’s always the best for you to read the instruction first and check with the manufacturer / gear’s shop before washing it. Wash your jacket with a tech wash like Granger’s, Nikwax, McNett or Penguin, or else a mild, non-bio, no scents detergent is also fine, check the instruction first and see if it has to be hand wash, dry wash, if washing machine can be used? Just use it. Don’t worry. Zip up your jacket and put them in a laundry bag, normally we set the temperature to around 30 to 40 degrees for most jackets but you’d better check with the manufacturers first. Do Not use bleach!! Never ever use bleach!! I don’t usually rinse my jacket, usually I just take it out and let it dry naturally under indoor environment. Or just use the low rinsing cycle. Apply spray-on DWR product when your jacket is still wet. When your jacket is totally dry, put a towel on top and iron it with medium heat. Same as the important rule for buying the best snowboard goggles is – always buy you jacket before going for your snowboarding holidays, because it’s usually more expensive in the ski resorts! So here’s what we think about the best snowboarding jackets for women. We try to consider base on a balance of appearance, functions, and price. So I guess that’s all I can think of about buying a snowboarding jacket that fits you till now. Do you agree or disagree with our choices? Is there anything else you want to know? Leave a comment below with any feedback or questions.